My website features the best Paris real estate search for homes, condos, land and multi-residential properties available. It is the only site you will ever need! It is easy-to-use and updated by the official MLS database every 15 minutes. You can save searches, and get daily email alerts of new listings, price changes and market reports. My Interactive Map Search allows you to view properties on a map or refine your search by drawing the boundaries around the area you desire. Paris, Ontario is a short 10-minute drive from Brantford and has grown in population In recent years. The area is considered desirable due to its’ wide variety of housing styles, quaint restaurants overlooking the Grand River and the heritage style downtown core which attracts many weekend vacationers especially during the Spring and Summer seasons. There are many opportunities for outdoor living in Paris, including fishing and canoeing and scenic walking trails. The Paris Real Estate Market has enjoyed an explosion of new housing over the last 10 to 15 years and the area is enjoyed by retirees as well as younger couples with families. There is something for everyone here in this gem of a Town. 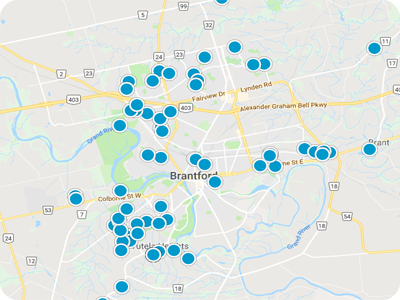 Our site Property For Sale in Brantford, provides real-time MLS Listings that are updated multiple times per day to ensure our clients are the first to know about any active listings in the Paris area.